There are as many possibilities as there are choices. Try to look back at a decision you made in the past – what you ate for lunch at a certain day, a relationship with someone, or even the clubs you decided to join. What if you ate at a fastfood restaurant instead of eating the packed lunch your mom made? What if you didn’t confess to the girl you like? What if you joined a sporting club instead of the school publication? How different would your life be then? Yes, very much like branching paths in a visual novel, a different outcome could have occurred had we chosen a different option. 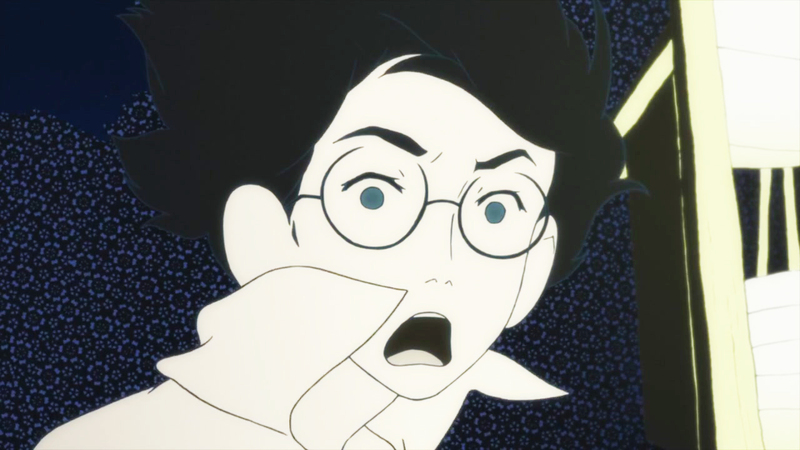 This “What if..” scenario is the key element in The Tatami Galaxy. Youjouhan Shinwa Taikei (literally, 4.5 Tatami Mythology), or The Tatami Galaxy is based on a campus novel with the same title. Campus novels are called as such because in general the story is set within a school setting. 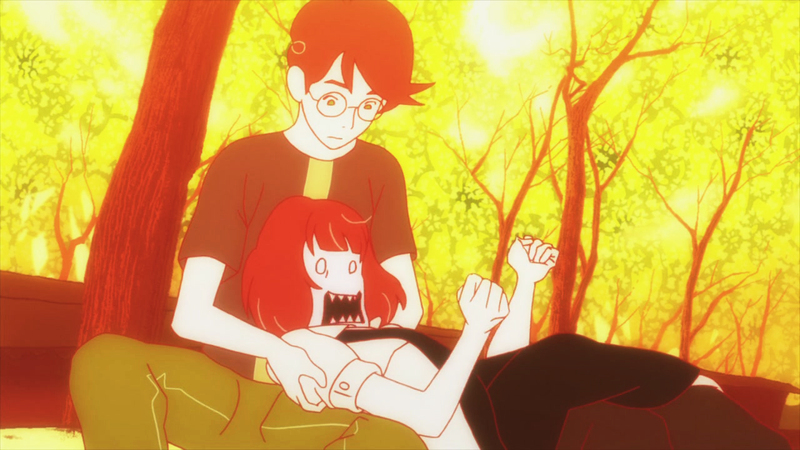 Before I started following ongoing shows (and before I got on MAL as well), I’ve always considered The Tatami Galaxy as a sort of “classic” title in anime. It felt like it had an air of tradition, the way I always see its name being thrown around here and there. I paid the title no heed for a while, thinking that it was going to be a bit hard to adjust since it was an “old” show. To my surprise earlier this month, it was a Spring 2010 series. Seeing as the Fall was beginning to prepare its final set, I decided to take the opportunity to watch it. I still felt that it was a classic in its own right, however, it was by no means traditional. Our main character’s name was never actually given, but he is referred to as Watashi. The story is introduced through his monologues about his first day of being a freshman, and how he was presented with countless “circles” or clubs that he could join, so as to attain his dream of a “rose-colored” campus life. It sounds simple at first, but what’s unique about the plot is, the events of one episode would restart to his first day whenever he encountered some sort of failure. Each episode therefore presents Watashi in a different circle in different circumstances. However, this series can’t really be called episodic, since the premise requires this sort of development, and in one way or another, the episodes are still directly correlated, which I will further discuss later on. One thing that you would notice immediately if you watched this is, the speed at which Watashi talks during his monologues. No breath breaks whatsoever. The first few episodes became an adjustment period for this. Having not learned Japanese, most of the time it felt like I was speed reading. Had I not been interested in the plot, I would’ve dropped it after the first monologue. It was really an uncomfortable experience at first but I can say that you’ll get used to it eventually. And if you do get used to it, the dialogue, aside from making sense, starts being enjoyable. It has a very mature tone to it which gave it that “classic” feel. I’d attribute the effectiveness of the dialogue to the characters. 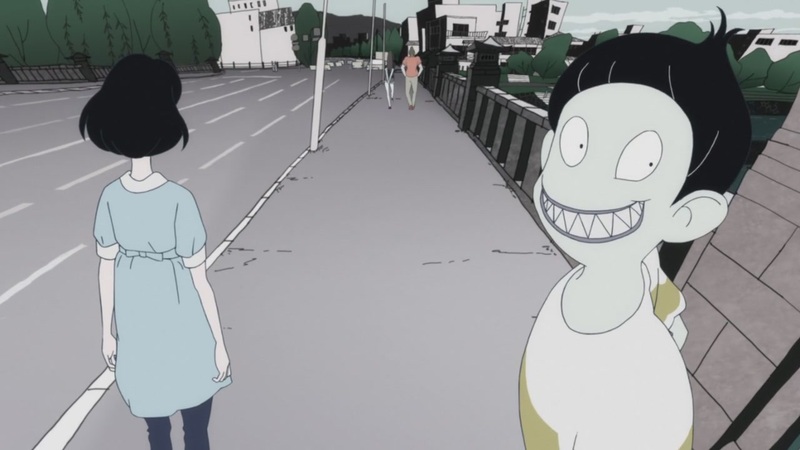 Although Watashi joins a different circle, the series almost always revolves around six or seven characters. The first three I’d consider the main cast. Aside from Watashi, the main cast consists of Ozu – the person Watashi exclaims to be the reason behind his failures, but is also his only “true” friend – and Akashi – Watashi’s moth-hating junior who he encounters during his days in the circles. Their conversation would be very light and funny at times, but would sometimes do some foreshadowing. The characters themselves are unique and intriguing, to which I found Akashi the most interesting out of the three. There’s also the fortune teller that Watashi always stumbles across, whose only reading for Watashi was that there was “an opportunity dangling in front of him”. Although the series kinda dragged towards the middle (specifically the three girls’ romance arc) what really made me think highly of this series was its peculiar ending. Continuing what I said about the correlation of the episodes, the overall theme finally blossomed around episode ten, wherein Watashi had become trapped in a seemingly endless space of different versions of his 4.5 tatami room (possibly where the title came from). It was the culmination of the overall theme of “What if..” wherein Watashi had now seen only some of the countless possible versions of himself that could’ve been. I take it that the underlying theme is acceptance of one’s self and one’s own decisions as well as its repercussions, and how there is no rose-colored campus life. Watashi’s acceptance of Ozu, Akashi, and everything that happened to him during his loop of campus lives provided the best possible ending that I could’ve imagined for this series. 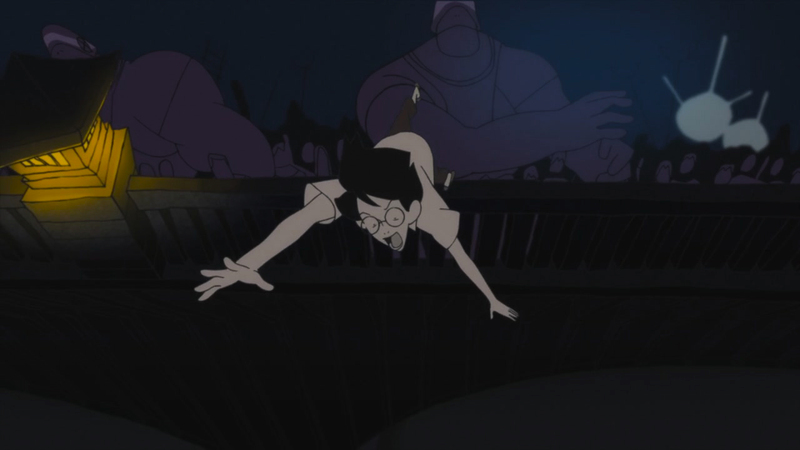 So yeah, intensely heavy dialogue aside, The Tatami Galaxy was a nice ride. If I were to give it a score, I’d say way above average, maybe an eight and a half out of ten. I would’ve given it a nine or even a perfect score if it had more romance between Akashi and Watashi. I dunno, I mean, you can’t deny that they were building that up. 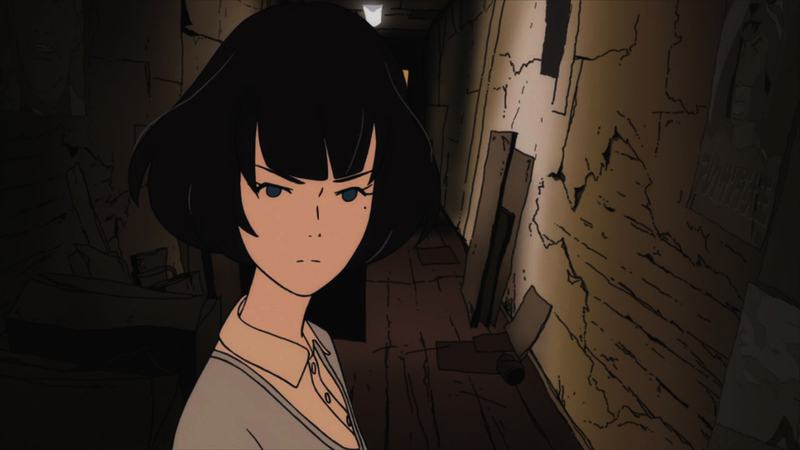 This entry was posted in Reviews, The Tatami Galaxy and tagged Anime, Review, The Tatami Galaxy, Yojouhan Shinwa Taikei by Leap250. Bookmark the permalink.